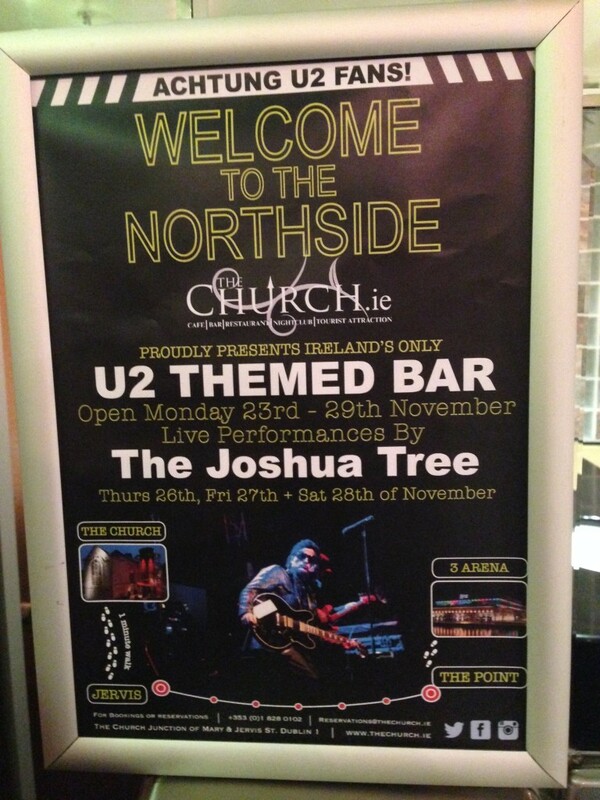 As Dublin is preparing itself to be swamped by U2 fans from all over the world for the gigs in the Three arena next week, The Church bar on Jervis street is preparing to give them a very warm welcome. They will be opening a U2 themed bar for the entire week that U2 play in Dublin. So, from Monday 23rd they’ll be saying #WelcomeToTheNorthside and declaring themselves an official fan meeting point. Every day from 4-6pm before the shows DJ Eamonn Barrett will be playing the hits to get you in the mood. They have a full food menu, selected 2 for 1 drink specials, and even a U2 cocktail list. They will also have one of Ireland’s best U2 tribute acts, The Joshua Tree, playing live after the gigs on Thursday 26th at 11pm, and also at 12am on 27th and 28th. They’ll also have a few giveaways for U2 photographs. Looks like you’re on to a winner if you want to get in the mood ahead of the gigs.